Depends. Are you counting Paul McGann in your contemplation? Actually your initial thought was right - it's an upside down painting of a Silent. anyway, I don't know whether anyone has written this [sorry if they have, this thread is beyond long] but in Blink [series..4? ], Martha and Tennant!Who say hey visit the moon landing 4 times. thoughts? I think the last old Who I watched had the Sontarons teaming up with a Spanish crime cartel. And the Doctor got a disease. I don't think we do know why River knows his proper name. Before the doctor is killed he says something to the astronaut, perhaps it's River inside the space suit and the Doctor told her his name. This would also explain why River said "of course not" when she couldn't shoot the astronaut because it would have been her past. Why are you guys giving me answers? Also hence why this week they are now making it obvious that Rory and Amy go to bed together- that has never been used before has it. I am sure it has never been implied that companions actually have a bedroom- or did I miss that before too? Hence the pregnant/not pregnant thing... as in little baby 'Pond' could have been conceived in the TARDIS? Also setting us up for the scary running through the evil TARDIS next week? In old Dr Who both Romana's and Adrics bedrooms were shown, I cant remember if anyone elses was though. I'm not sure which has been my favourite series to be honest. The first thing Idris gets to do is die, in the first scene..
"You see the Doctor do things he's never done before"
Curious. Saturday, just come now. I think series 5 was my favourite but I would have liked to have seen Tennant with a better lead writer. 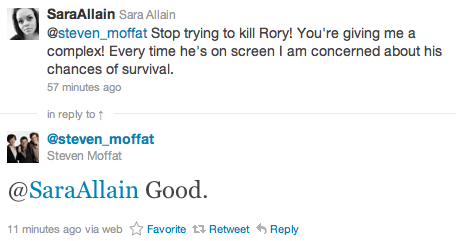 Although I don't think he would have suited Moffat and the direction he appears to want DW to go. Stop with the ****ing RTD hate, it's unwarranted. I understand RTD was needed and his style of storytelling was needed. But really it could have been so much better. I went with the specials ironically. I went with the Specials. They had that epic finality to them, both in terms of twists and emotion. You seen the Doctor portrayed in this arrogant and sinister way, and then you had the emotional rollarcoaster (starting from the cafe scene with Wilfred, to the Master's redemption and finishing off with the four knocks and his tearful regeneration). The specials reeled me in. I watched series 4 occasionally and but I started following Doctor Who with the specials but I can't choose between the specials and series 5. I went with Series 3. I can pick the worst series far easier than i can pick the best.